Brian Robinson is of the Maluyligal and Wuthathi tribal groups of the Torres Strait and Cape York Peninsula and a descendant of the Dayak people of Malaysia. 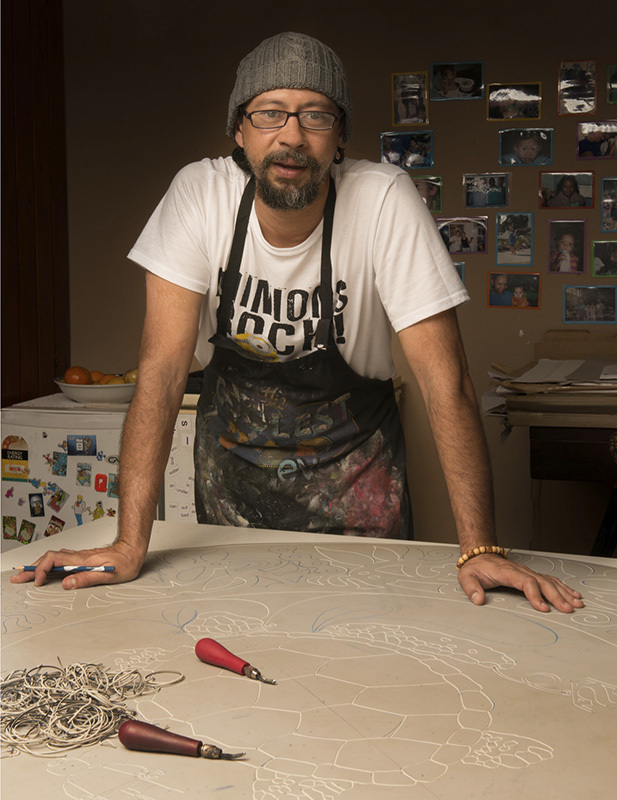 Born on Waiben (Thursday Island) and now Cairns-based, Robinson is known for his printmaking, sculpture and public art in which he uses a variety of techniques to produce bold, innovative and distinctive works. Robinson is recognised as an artist of significant merit, who steps outside existing preconceptions of the role of the Indigenous artist, to forge an individual career. His work is driven by an innovative and solo career, which also promotes his unique cultural aesthetic. In this way he develops his practice as an artist whose community contribution is acknowledged. He provides a strong role model with his ability to meld contemporary influences and cultural knowledge, and has developed a dynamic aesthetic that broadens and extends the popular understanding of Indigenous art. His experience in the art world, however, extends well beyond his practice as an artist. 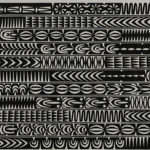 In 2010, Brian resigned from a curatorial role spanning fifteen years at Cairns Regional Gallery to undertake a residency at the Djumbunji Press KickArts Fine Art Printmaking studio. A prolific artist whose vision of his work is finely honed by his curatorial expertise, Brian’s images have evolved from a planar surface into three-dimensional forms. Similarly, the motifs that wheel freely throughout his linocuts, etchings and sculptures are profuse – ranging from images of Astro Boy, USB flash drives and super heroes to pearl shell pendants, marine creatures and renaissance figures. He draws from experiences garnered during his travels also, focussing on details of architecture and the built environment as well as mythology from other cultures to create parallels with his indigenous knowledge systems. Robinson’s work has contributed significantly to his home environs of Cairns through a number of major public art installations including his iconic stainless steel woven fish sculptures installed in the Cairns Esplanade Lagoon in 2003 and more recently Reef Guardian, a monumental sculptural work that focuses on the Great Barrier Reef. Robinson’s art reflects the tropical marine environment from his surrounding, and the inhabitants of those aquatic environments. It is an essential part of his life and culture, imbued with the customs, traditions and lifestyles of the Aboriginal and Torres Strait Islander peoples of Far North Queensland. The animals from ancestral stories and their presence today are also an integral feature of Robinson’s work. His work has featured in many exhibitions nationally and internationally, including in Berlin, Noumea, Washington DC, New York, The Netherlands and his work is held in major collections including National Gallery of Australia; the Queensland Art Gallery/Gallery of Modern Art; Tjibaou Cultural Centre, New Caledonia; the Australian National Maritime Museum; and the Kluge-Ruhe Aboriginal Art Collection, Virginia, USA.